Egypt is one of the most photogenic places on Earth, not just for its antiquities, but for its warm and friendly people. I have been to Egypt many times in my career and I find that I can never get enough of it, although I do have safety concerns. One of my favorite places in Egypt is il Fontina Island, as it is called in Arabic, and known to most of the world as Elephantine Island. il Fontina is situated smack in the middle of the Nile River, immediately opposite downtown Aswan and its famous Cornish el Nile (Nile river walk). It has carried its elephantine name since antiquity due to the huge boulders that sit near the island, resembling the curved backs of elephants. You might be surprised to know that elephants once roamed as far north as Aswan, possibly as late as 5,000 B.C., before desertification overtook southern Egypt. What makes il Fontina so special are its people. Egyptians are composed of two major branches; those of mid-eastern descent and the Nubians, a dark-skinned people whose stock from the south, in what is present day Sudan and even further south. il Fontina is populated by those of Nubian heritage. They are Muslim, but have a rich oral history that includes their African heritage. Only those who have walked the dirt alleyways of il Fontina can understand what it is like. 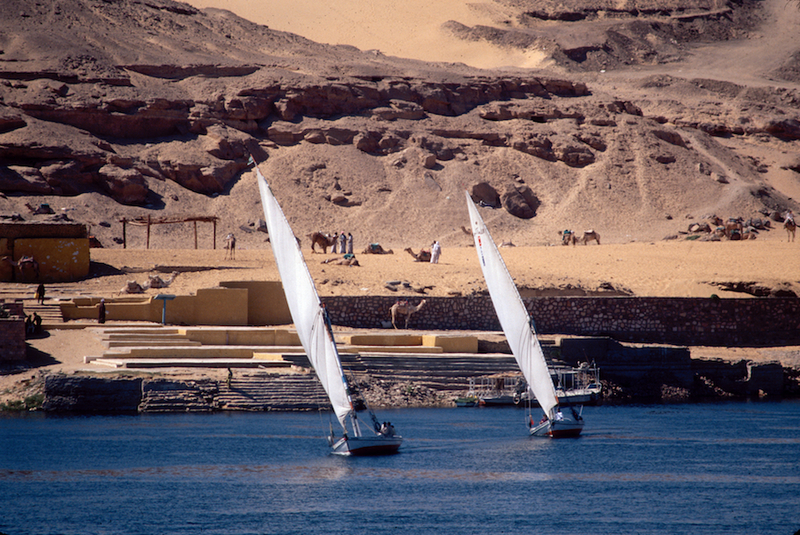 Literally five minutes by public ferry from the hustle, bustle and hawking of Aswan, you are suddenly transported to a world that existed 5,000 years ago. The houses are still built as they were in pre-Dynastic times, out of mud brick and even the more primitive mud daub construction. If you go here (http://www.lesterpickerphoto.com/photo.php?id=271&gallery=egypt) you can see on my Gallery website what I am talking about. People still fish the Nile River using round, weighted nets that are tossed by hand. Fellucas sail lazily by, their masts silhouetted by the cloudless azure sky. The only sounds you’ll hear are the bleating of goats and the calls of mothers to children when strangers come near. Women dress in traditional Muslim garb as they walk barefoot around one of the two villages (http://www.lesterpickerphoto.com/photo.php?id=273&gallery=egypt). I recall vividly a bright, February day in 2001 as I sat alone on a shoreline bluff, eating my lunch of cheese and peasant bread a few yards above the fishing fleet, watching the men and boys repairing nets and boats. Suddenly a woman appeared behind me, looking for her son. “Mohammed!,” she yelled down. Immediately at least half a dozen men looked up. I smiled at this natural by-product of Muslim life, where names are traditionally derived from one of the 99 names for Allah in the Koran.